Our surveys and 360 degree evaluation tool help both people and organizations meet their full potential. 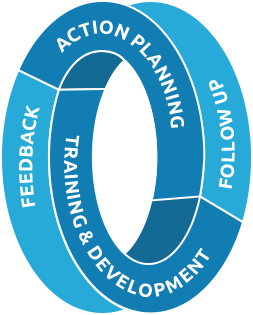 The 360 Degree Feedback Tool helps to identify areas of improvement throughout any organization. Feedback focused on personal development has the ability to create the self­-awareness needed to change behaviour. Analyzing the results of this feedback tool helps employees improve performance and build on their strengths. How can I communicate better with others? What areas are most critical for my action plans? What are my strengths and areas for improvement? In what areas have I improved my performance and effectiveness since my last assessment? Concord’s database of 360 degree surveys, themes and questions can be easily customized to meet your needs. Please contact us to discuss the unique needs of your organization. 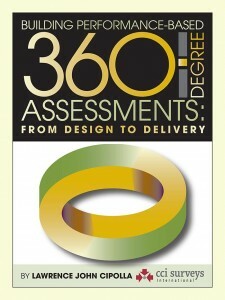 See Building 360 Degree Feedback: the Book for an in depth guide to creating your own 360 feedback assessments. Increased self-awareness, by understanding how your behavior is perceived by others, and comparing this perception with your own self-assessment of your own work behavior. To identify priority areas where you might change your behavior in order to improve your work performance and organizational effectiveness. More focused learning and development activities, and increased individual ownership for self-development. To identify and build upon the strengths that you are currently exhibiting. Feedback is essential in facilitating performance improvement. It informs employees of their actions that create problems for others, and what behavioral changes may be necessary to improve working relationships, team synergy, performance outputs and customer service. Received in a positive, open-minded, non-defensive spirit, 360-feedback can play a major role in employee’s personal and professional growth, and job satisfaction. It can serve as a strong spur for personal development and behavior change. 360˚ feedback from peers and direct reports is frequently the only way that senior executives can get feedback on their performance, as there may just not be anybody else to do it. The data gathered from 360˚ feedback throughout the organization can be very useful in providing insight into organization-wide behaviors and competency (or the lack thereof), and what development and other interventions may be necessary to address weaknesses. Are you interested in the 360˚ Feedback Tool?